After a few go-arounds on The Dumpling Trail in Richmond, somehow one dinner just doesn't seem enough these days. This is especially true when Amy, Sharon and Diana were with me at a menu tasting at Ritual. We were all thinking the same thing: what were we going to eat afterwards? No, it wasn't dessert like Mimi and Jacqueline were suggesting. Rather, we wanted "food" and that we got, just around the corner from the newly opened Men-No Kura. 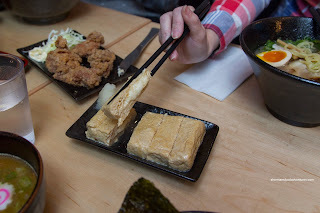 Before we got to the ramen, we tried both the Dashimaki Cheese and Dashimaki Mentaiko (not pictured). These were essentially rolled omelettes filled with cheese and tobiko respectively. Soft, airy and light, the omelettes were a pleasure to eat. I much preferred the stringy cheese rather than the tobiko though. I found the latter to be less impactful texturally, but it was more flavourful with a briny sweetness. Next was the Chicken Karaage, which was on point. It reminded me very much of the one from Mogu. 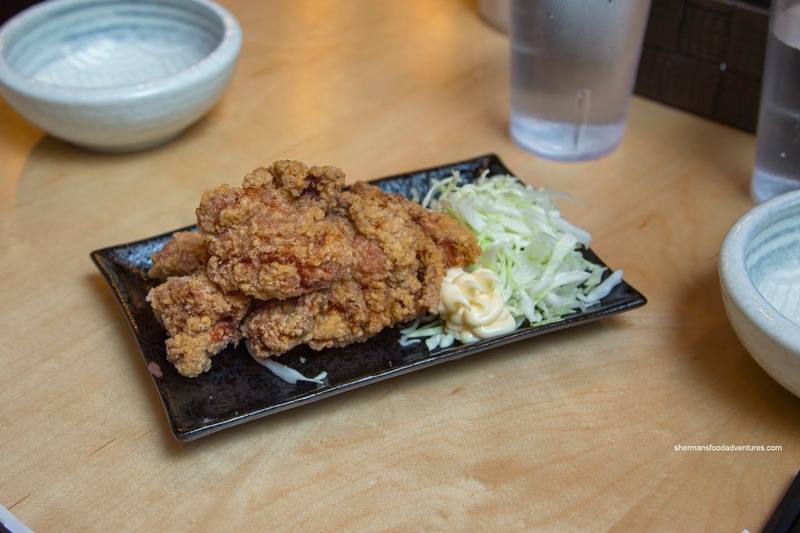 Hence, the same qualities existed such as the juicy and flavourful chicken as well as the lightly crispy batter as well. 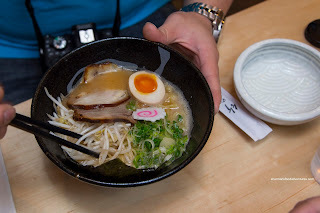 Sharon and Nathan each had the Shio and Shoyu Ramen which provided a nice baseline. The most obvious thing about the pork broth was that it was really rich and fatty. Hence, the concentrated pork flavour was very strong, yet at the same time, there was a restrained amount of salt. 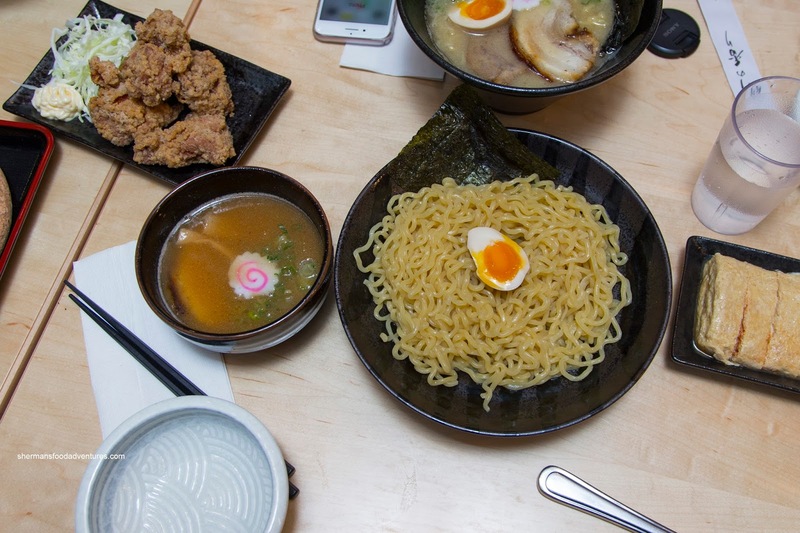 For this type of ramen, it appears that drinking the actual soup might be a little challenging as it was too heavy. On the other hand, it seemed to flavour and coat the noodles just enough much like a Dan Dan Noodle or Ja Jeun Mein. The noodles themselves were medium thickness and nicely al dente. I found the main difference between the 2 broths was that the shoyu did exhibit the soy flavour as expected over the light saltiness of the Shio. 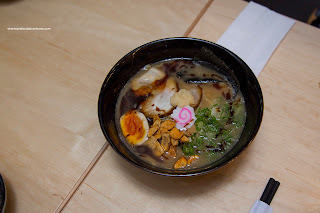 Amy went for my initial choice in the Black Garlic Ramen (I ended up choosing something else for variety purposes). This was even greasier due to the addition of the black garlic oil. Once again, the broth itself was probably best left as a flavouring agent rather than a drinkable soup. With that, it was successful where the chewy noodles were coated in a porky and nutty aromaticness that was rather appealing. 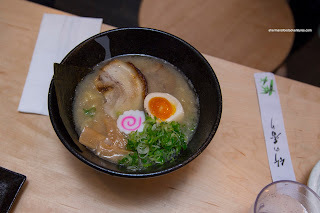 Peter had something similar in the Black Garlic Miso Ramen which was essentially the same except with the addition of miso. 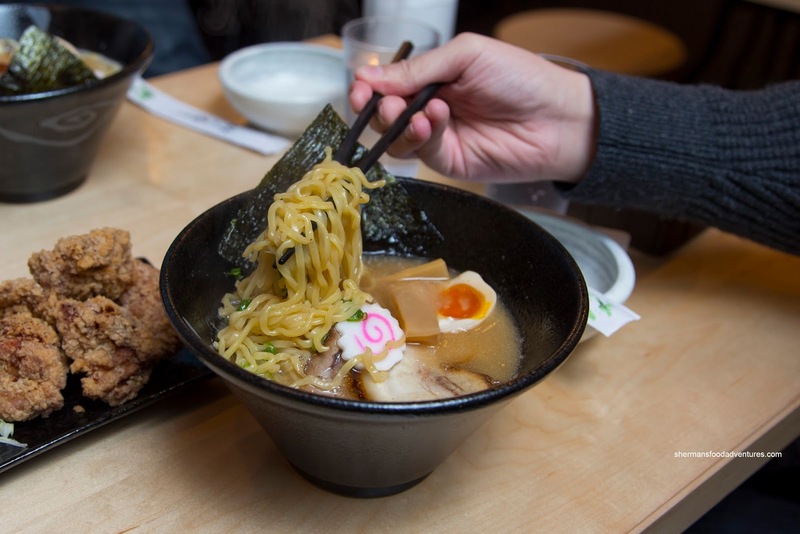 Therefore, a richer saltiness dominated the flavour profile of the broth. In addition, it lessened the impact of the black garlic as well. For myself, I had the Black Garlic Tsukemen that featured warm thicker noodles served with a side of dipping broth. I found the noodles to be quite robust and hearty which decreased the effectiveness of the broth. Hence, I found the flavours to be quite muted. The 2 slices of fatty chashu were excellent being buttery soft and full of natural concentrated flavours. The half-Ajitama egg was also executed properly with a soft runny centre while being mildly seasoned. 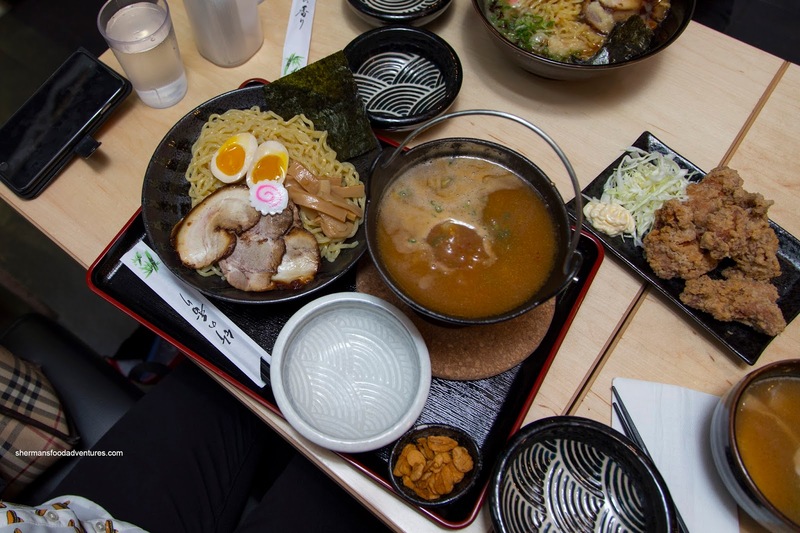 Diana went for the most expensive item in the Deluxe Spicy Tsukemen served cold with a side of bubbling broth. I found the cold noodles to be texturally better than my hot water blanched noodles. They were chewy and was a nice contrast to the hot semi-spicy broth. 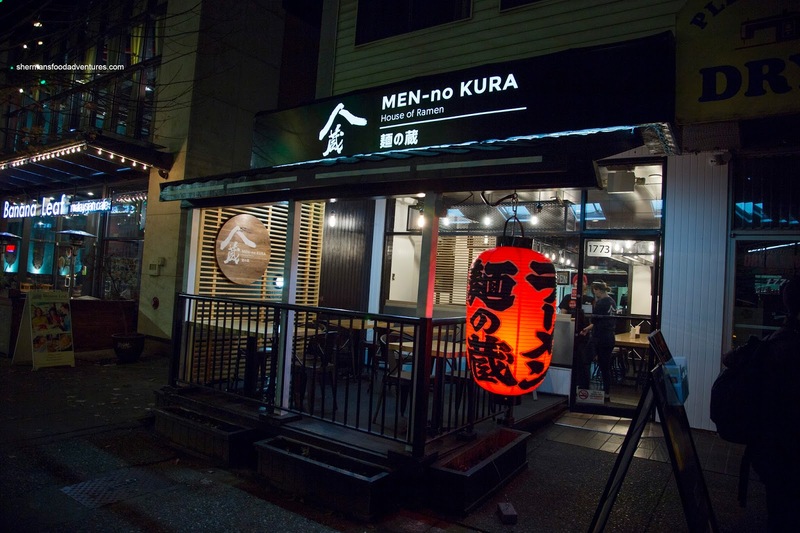 Overall, I thought the ramen at Men-no-Kura to be good with well-executed noodles, chashu and egg. However, the broth was a bit too rich and oily for me personally.